First introduced in 1992-94, these designs were first referred to as "Juniors". the most popular of Steinbach nutcrackers. 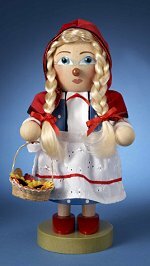 on this name and tradition from the Erzgebirge region of Germany. From Christian Steinbach's "Chubby" series of nutcrackers, is a 2014 design featuring this well know outlaw of early English folklore. Of course we all know that he robbed from the rich to give to the poor and In popular culture, Robin Hood and his band of "merry men" are usually portrayed as living in Sherwood Forest, in Nottinghamshire, where much of the action in the early ballads takes place. The Chubby series continues to be very popular, and the rich colors and detail on this classic figure are wonderful. 10-1/2 inches - 26,7 cm 2014 Introduction Made in Germany by Christian Steinbach, GmbH Signed by Karla Steinbach! 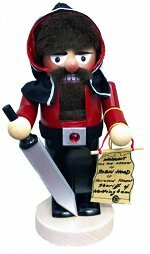 From Christian Steinbach's "Chubby" series of nutcrackers, is a 2014 design featuring this well known monarch of English history and companion nutcracker to Robin Hood. In popular culture, Robin Hood is typically seen as a contemporary and supporter of the late-12th-century king Richard the Lionheart, Robin being driven to outlawry during the misrule of Richard's brother John while Richard was away at the Third Crusade. This view first gained currency in the 16th century The Chubby series continues to be very popular, and the rich colors and detail on this classic figure are wonderful. 10-1/2 inches - 26,7 cm 2014 Introduction Made in Germany by Christian Steinbach, GmbH Signed by Karla Steinbach! 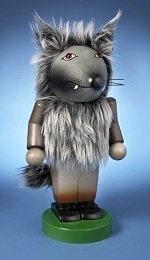 From Christian Steinbach's "Chubby" series of nutcrackers, is a 2014 design featuring this well known character from English folklore and enemy to Robin Hood. The Sheriff of Nottingham is an important figure in the legend of Robin Hood. The holder of the office of Nottingham's Sheriff, it is his task to capture outlaws such as Robin Hood, either to ensure the safety of trade routes through Sherwood Forest, or to keep them from poaching the King's deer. The Chubby series continues to be very popular, and the rich colors and detail on this classic figure are wonderful. 10-1/2 inches - 26,7 cm 2014 Introduction Made in Germany by Christian Steinbach, GmbH Signed by Karla Steinbach! From Christian Steinbach's "Chubby" series of nutcrackers, is this 2013 design featuring this well know fairy tale character from early French and later European tradition. The earliest known printed version first published by Charles Perrault, was known as Le Petit Chaperon Rouge and may have had its origins in 17th century French folklore. The Chubby series continues to be very popular, and the rich colors and detail on this classic figure are wonderful. 10-1/2 inches - 26,7 cm 2013 Introduction Made in Germany by Christian Steinbach, GmbH Signed by Karla Steinbach! From Christian Steinbach's "Chubby" series of nutcrackers, is this 2013 design featuring this well know fairy tale character from early French and later European tradition. The mean wolf or "Big Bad Wolf" after learning that Red Riding Hood is heading to her grandmother's house gets there earlier and after eating the grandmother whole (or in some stories, hiding her in the closet) waits for the girl, disguised as the grandma... The Chubby series continues to be very popular, and the rich colors and detail on this classic figure are wonderful. 10-1/2 inches - 26,7 cm 2013 Introduction Made in Germany by Christian Steinbach, GmbH Signed by Karla Steinbach!